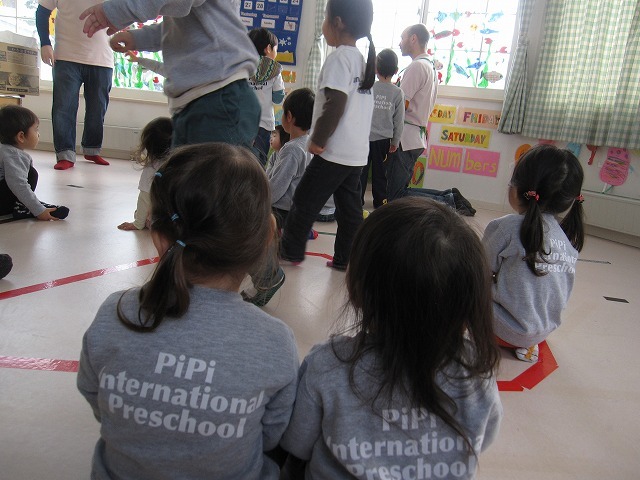 Today was a wild and crazy day at PiPi International School. 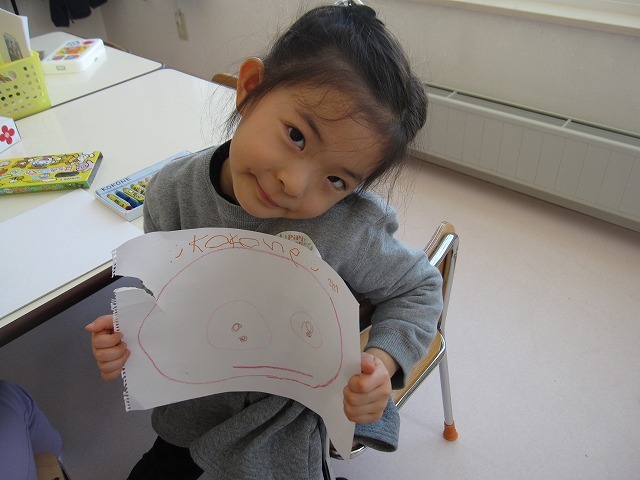 We had a good mix of strong personalities from the children today. 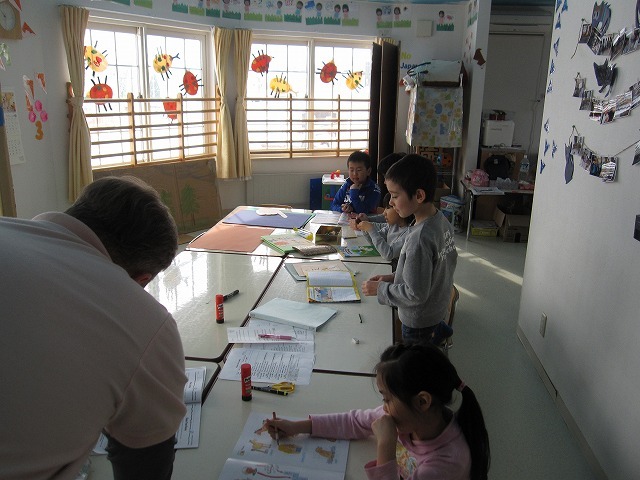 We started the day with an exercise to improve their memory and identification of the alphabet. 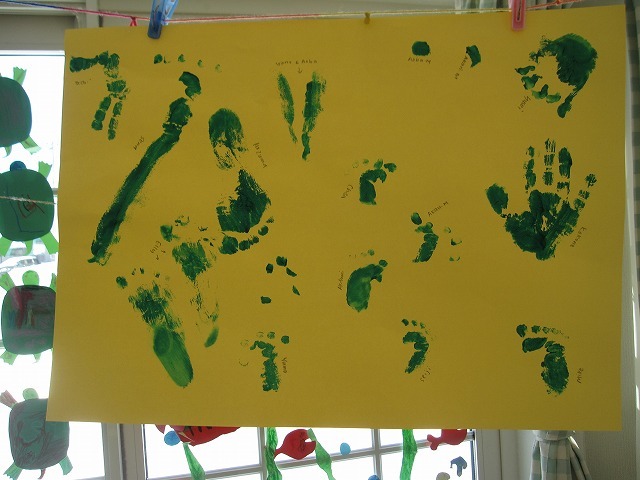 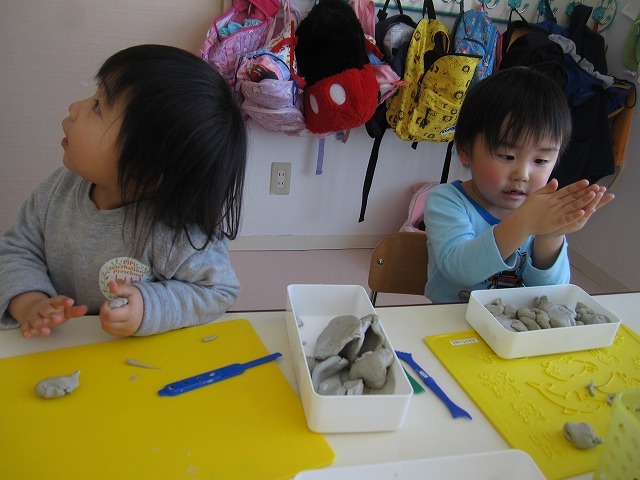 The kids also had a chance to use their fine motor skills. 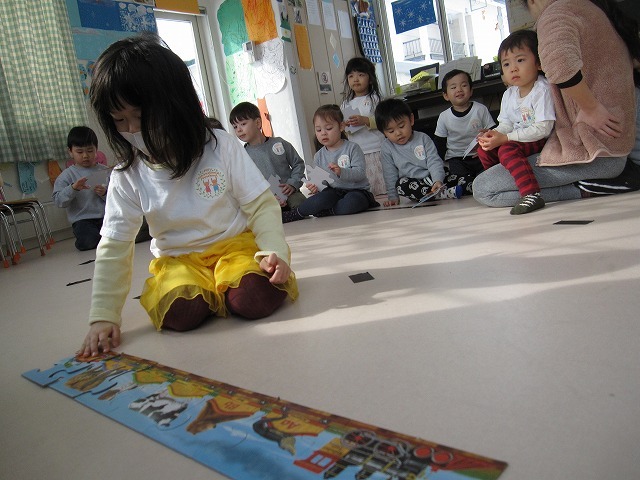 Each child was provided a different piece of the Alphabet Train puzzle. 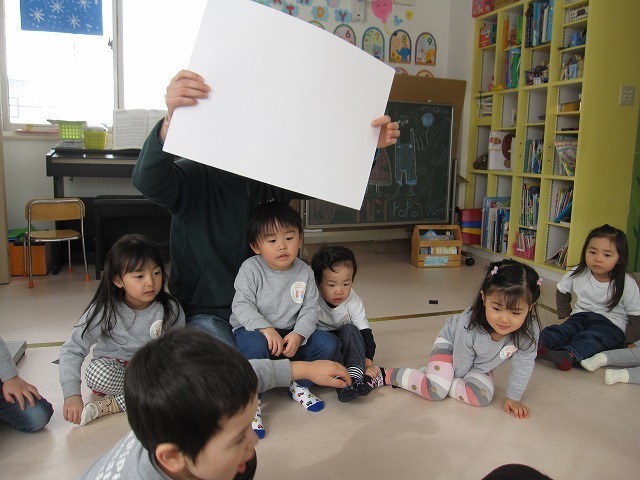 We started at the engine and built the entire train starting from the letter A. 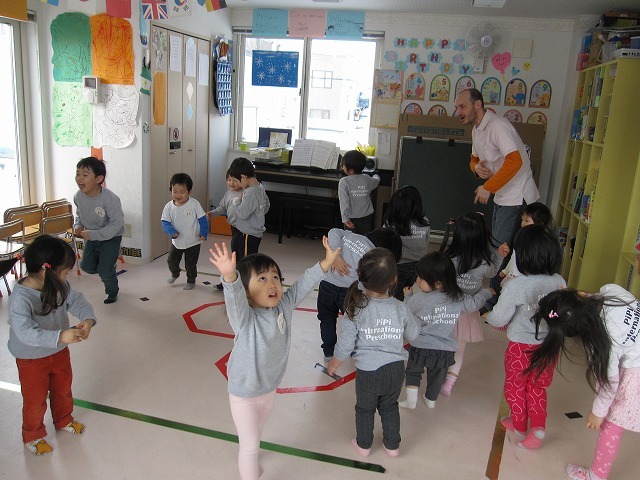 After the excercise we enjoyed some song and dance time. 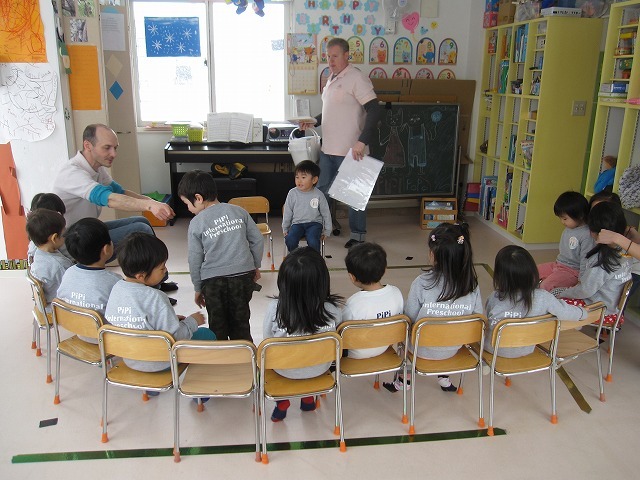 The kids especially liked the "Wheels on the Bus" song. 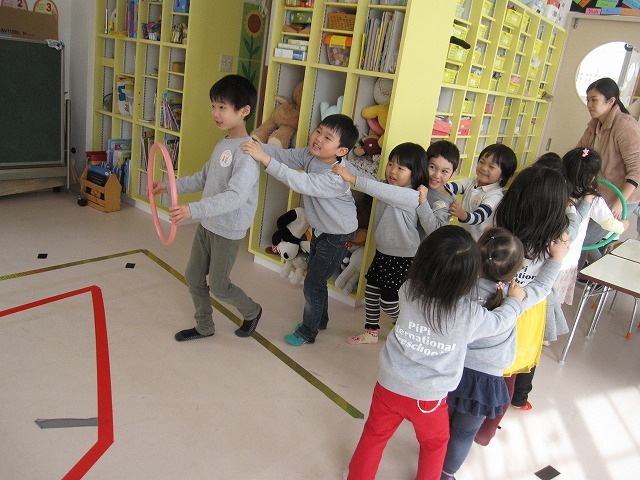 They pretended to be buses and drove around the room. 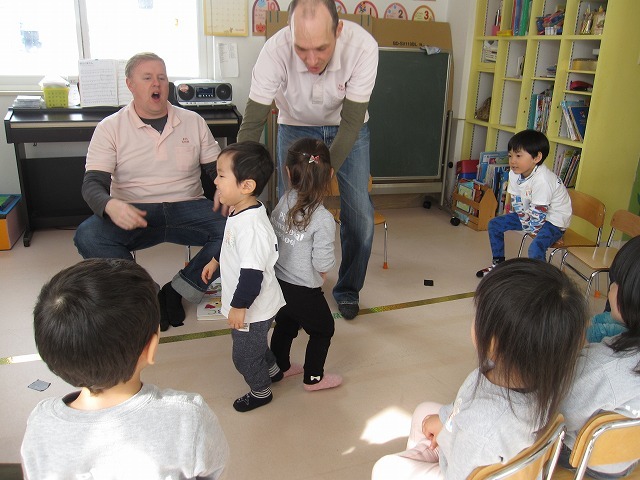 We also had a fun session of "Heads, Shoulders, Knees and Toes". 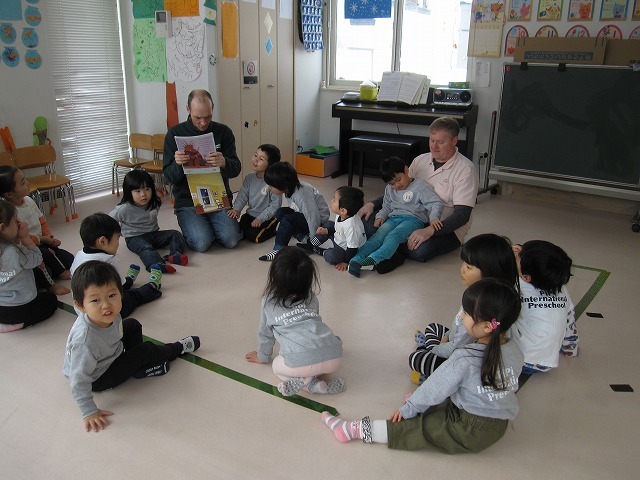 The kids enjoyed a story and then prepared for some outdoor activity. 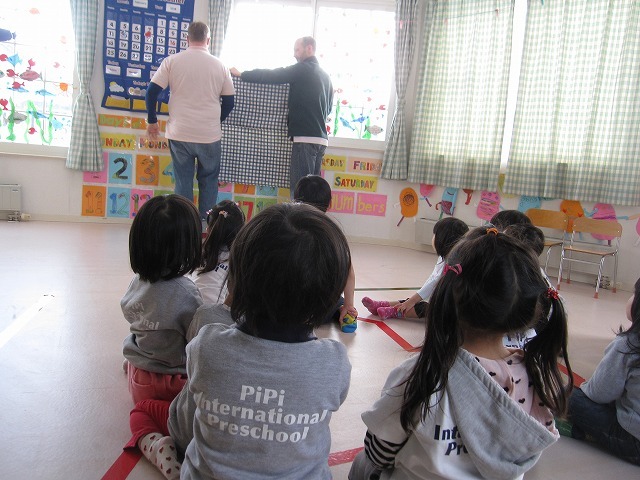 The children enjoyed going outside and playing in PiPi's backyard. 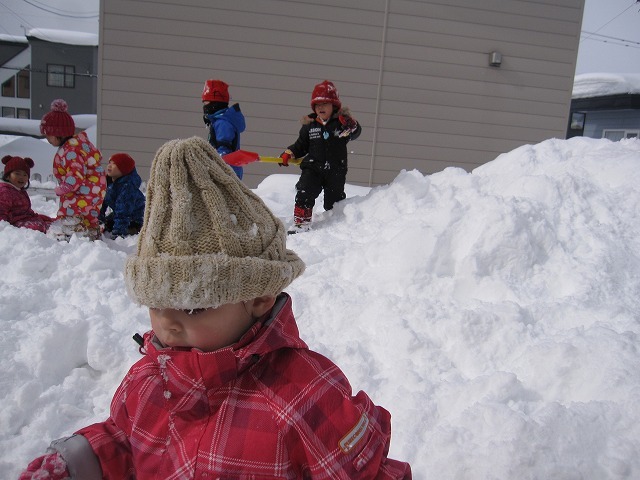 The temperature was warm and the kids were wearing their snow gear. 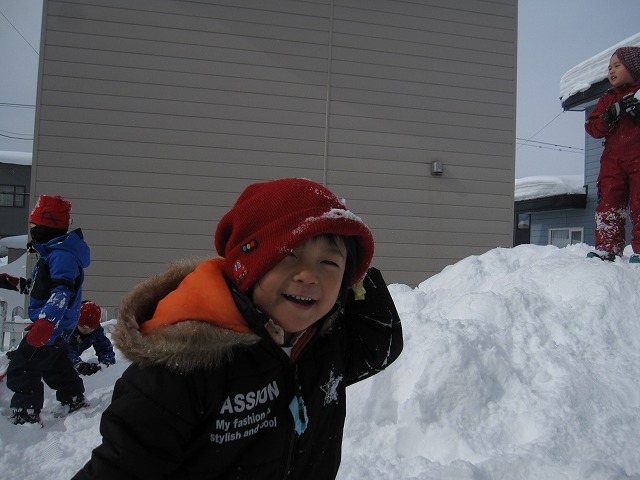 The kids had fun with sleds and shovels. 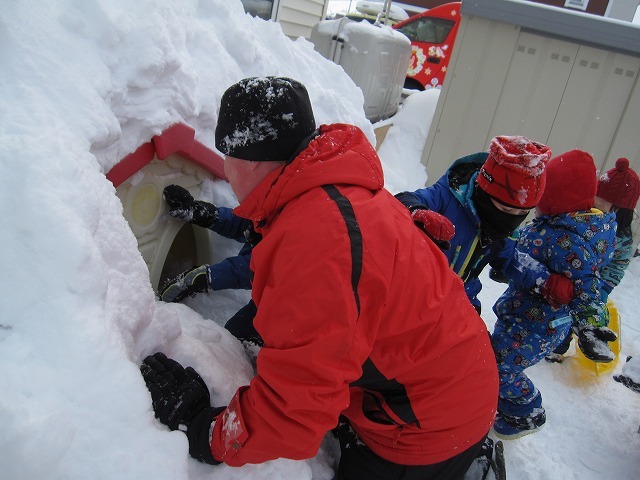 The kids had a lot of fun playing in their snow fort! 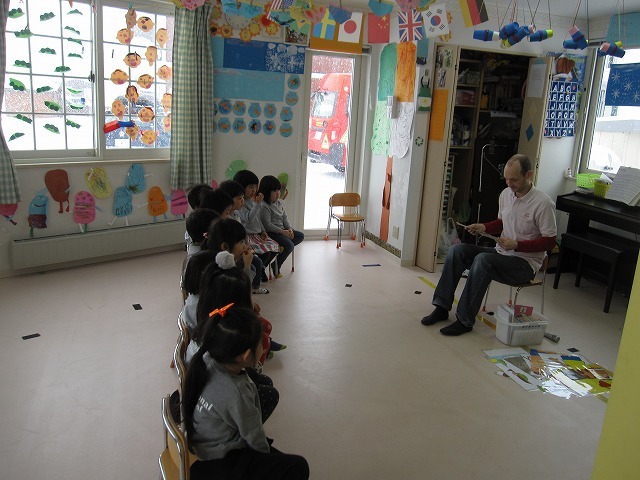 After lunch, we practiced individual speeches for Happyokai. 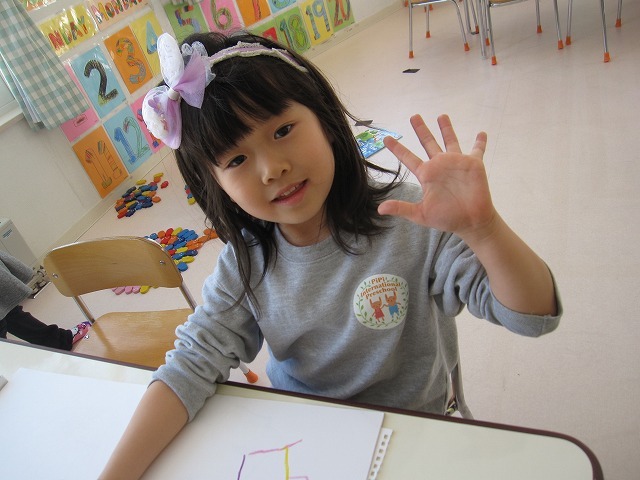 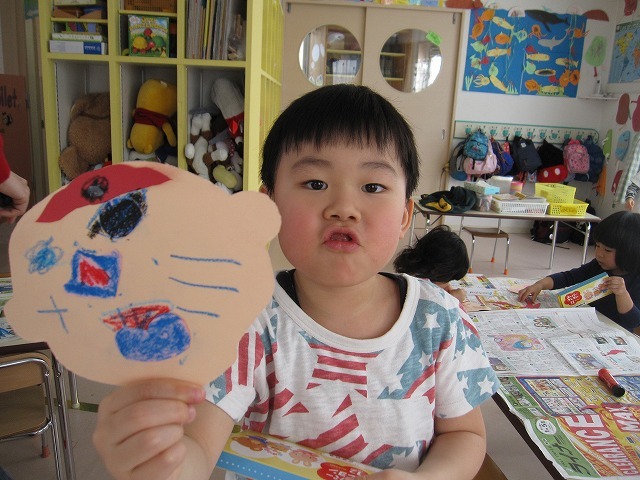 The children also played with trains, puzzles, a magnetic alphabet, and colored some pictures. 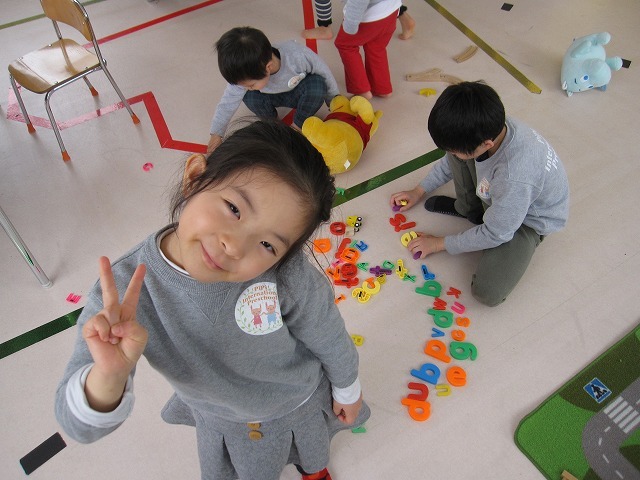 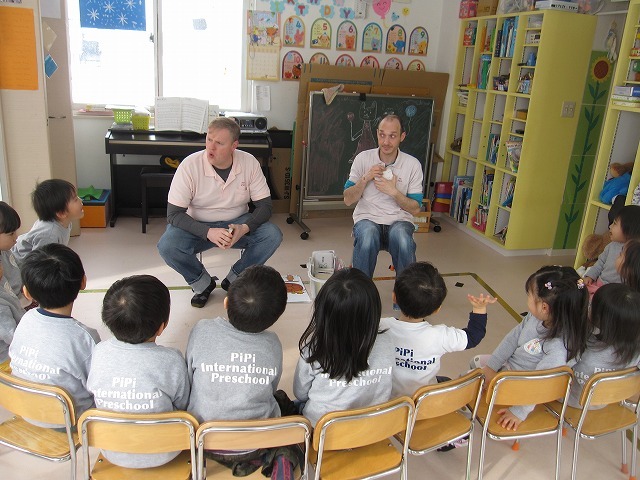 Greetings from PiPi International School. 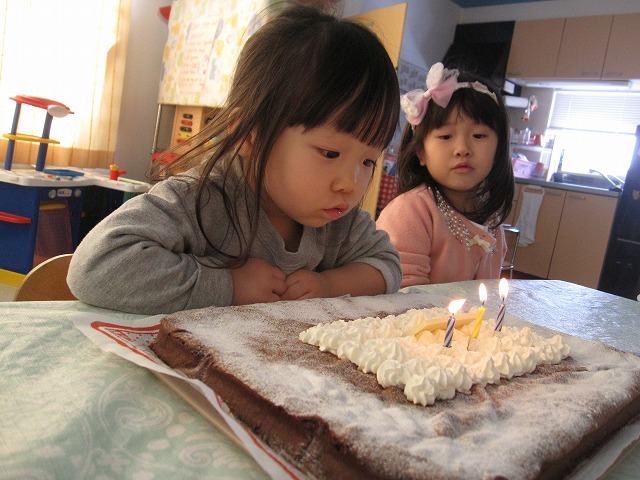 Today was another great day. 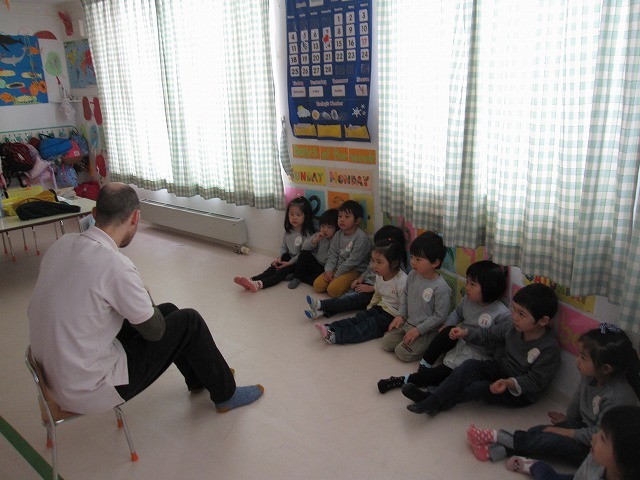 The children were unusually well behaved today. 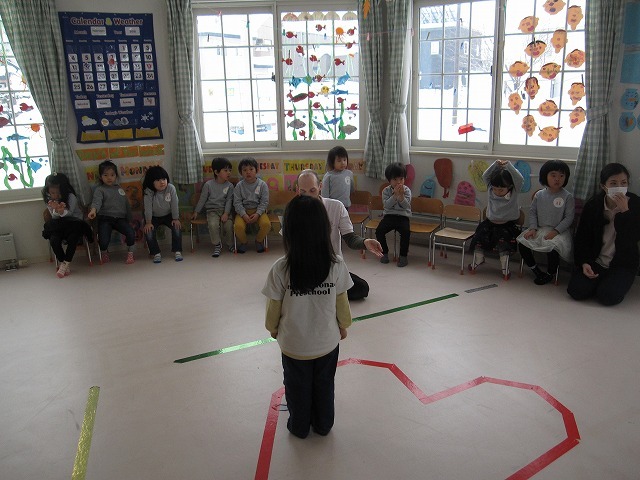 We started the moring circle by sharing a secret with each other. 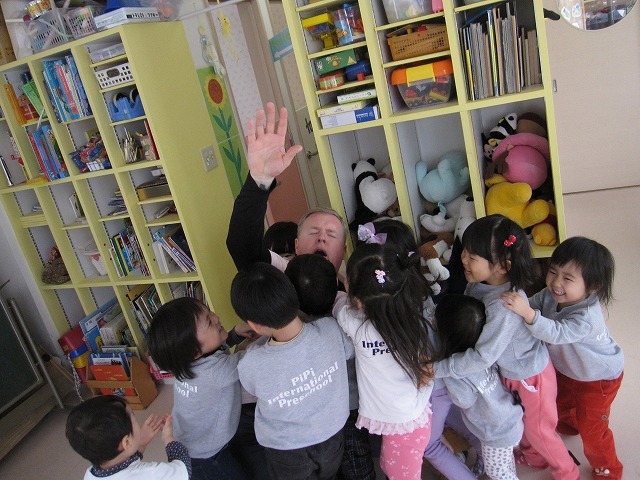 The secret was, "good morning". 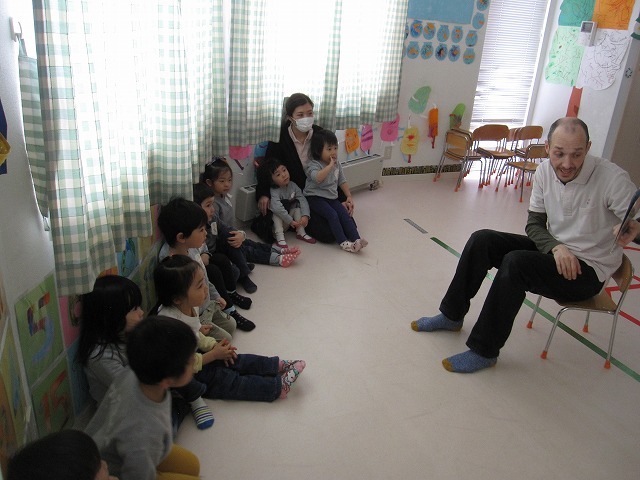 Each student had to whisper "good morning" to the student next to them. 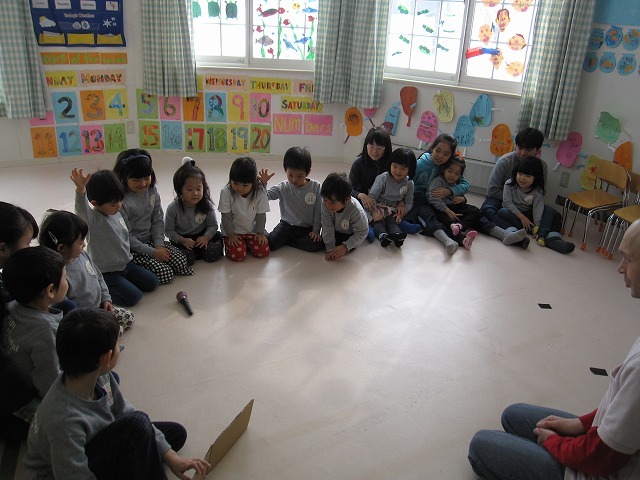 Next we showed the children 3 objects. 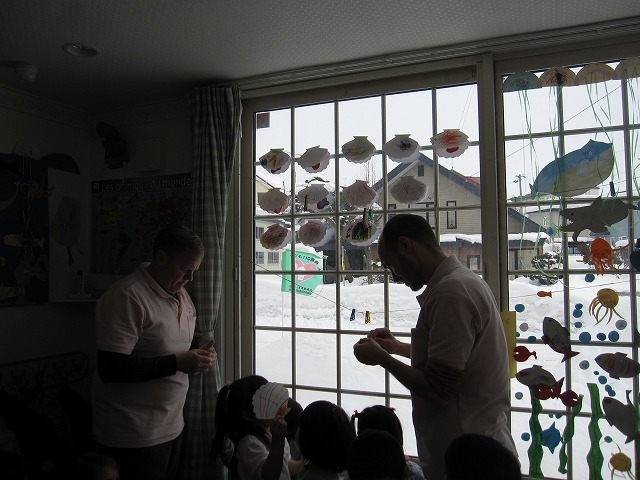 We placed the objects in the window sill and then covered them with a blanket. 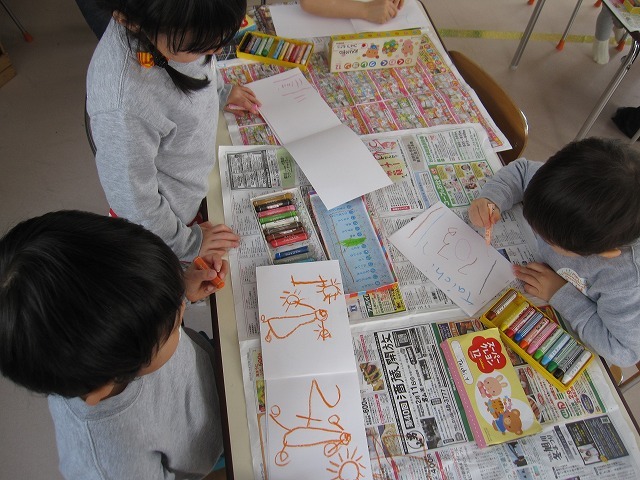 We made a change, and the kids had to guess what changed. 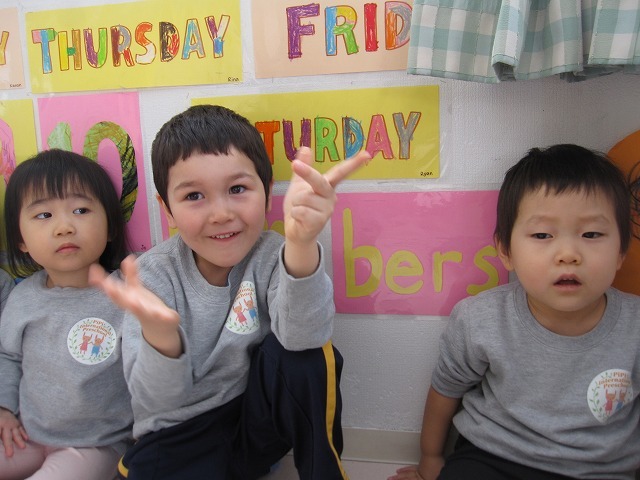 We reviewed words such as; missing, returned, and upside down. 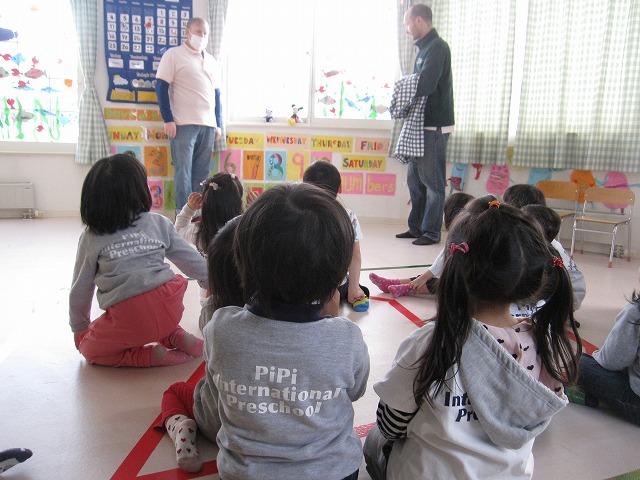 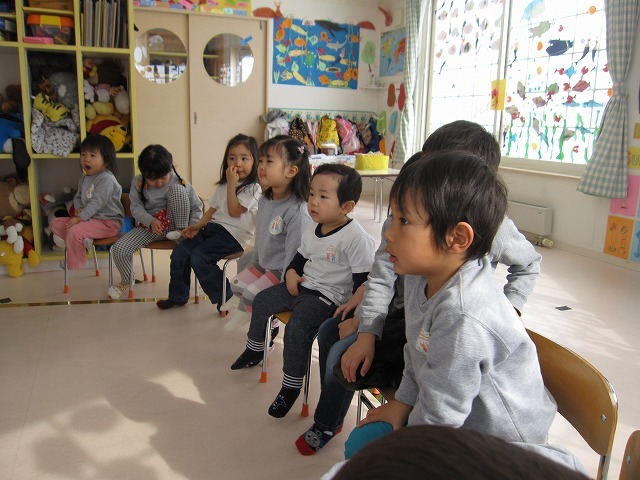 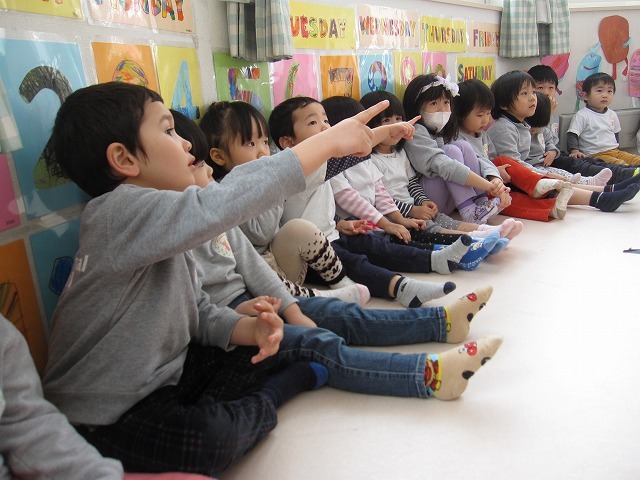 We spent a little bit of the moring by letting each child talk infront of their peers. 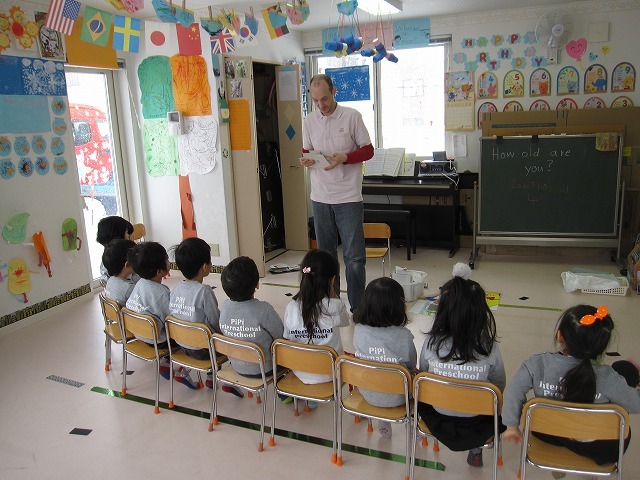 Most of the children had a speech to practice, and the ones without a speech were given a line to say based on their skill level. 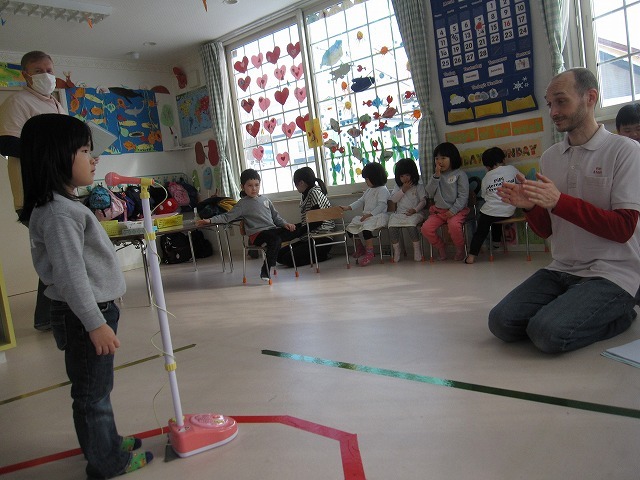 Everyone did a great job. 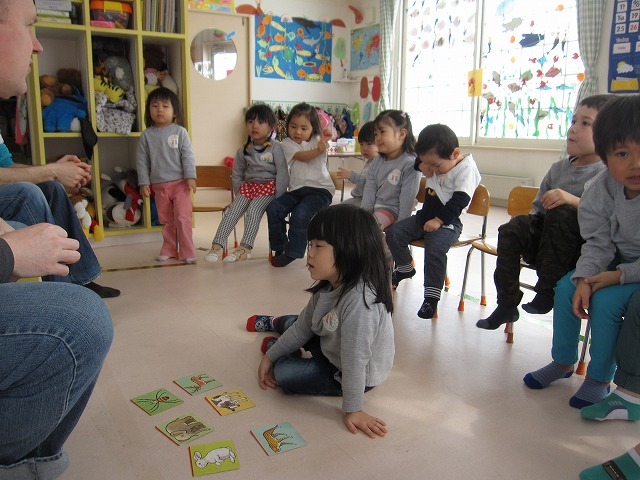 We conducted a short flashcard session. 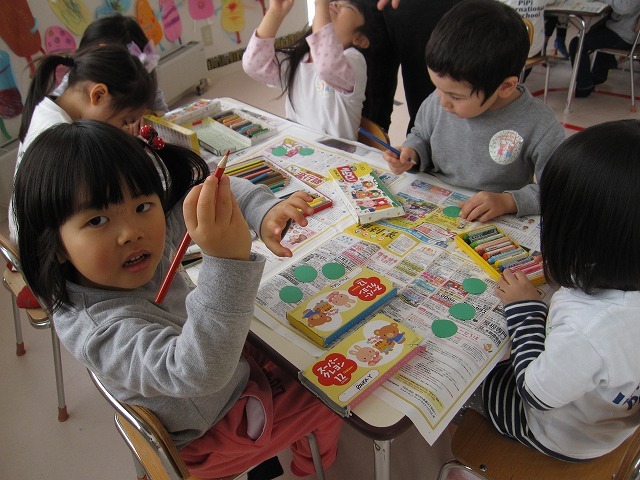 We concentrated on number identification and phonics. 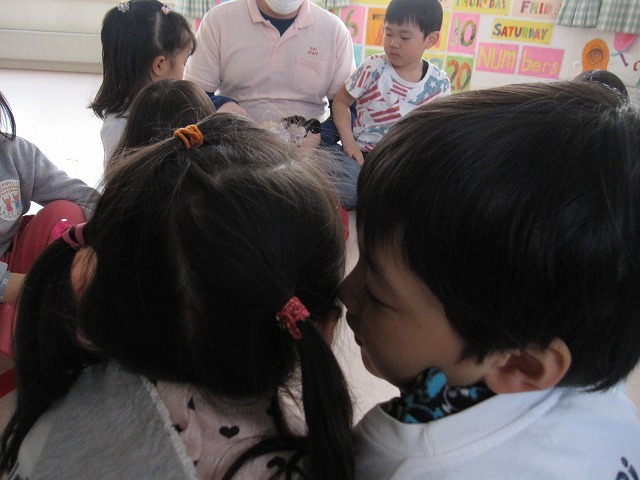 Then, we read a story about different occupations. 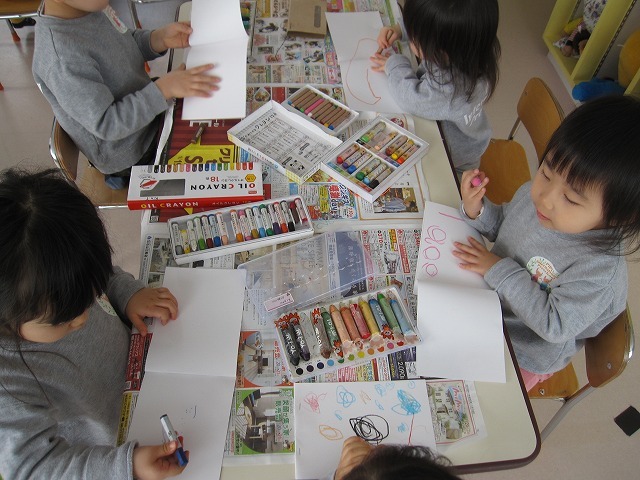 We asked what the kids want to be when they grow up. 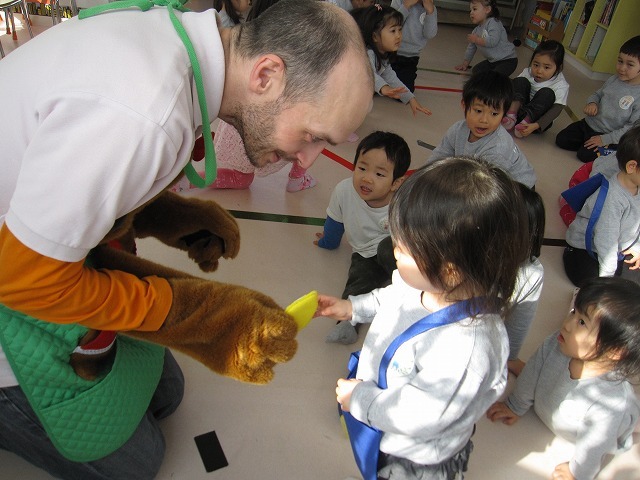 Doctor was a popular choice. 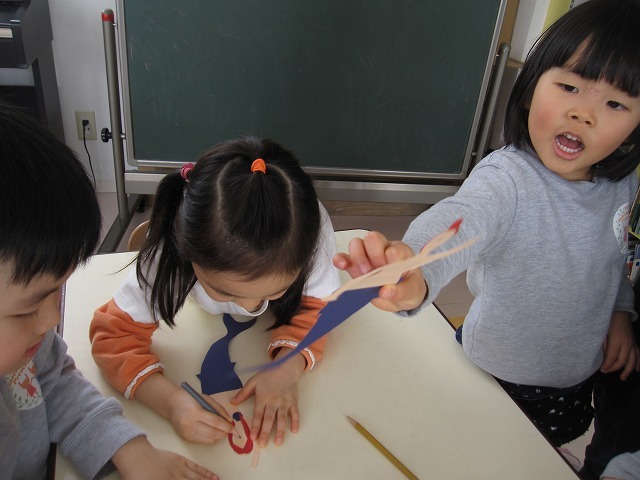 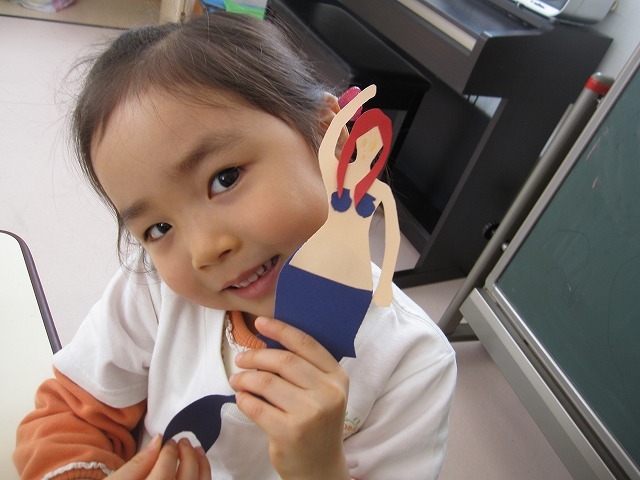 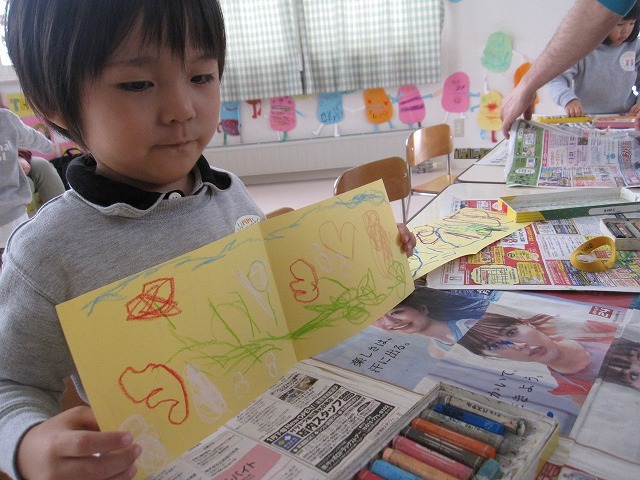 Finally, we enjoyed craft time to end the morning. 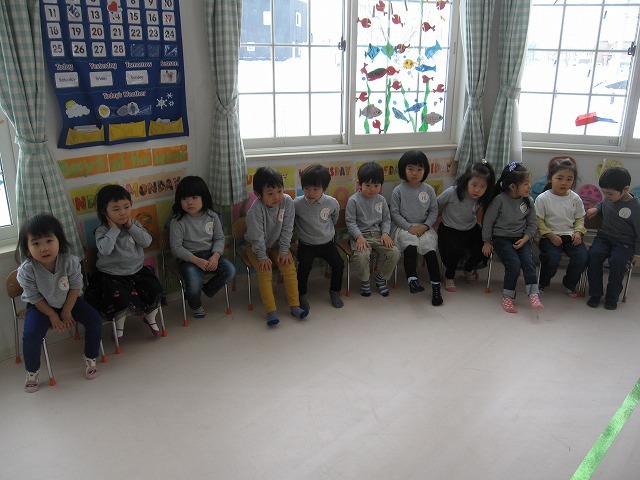 Each child made a face. 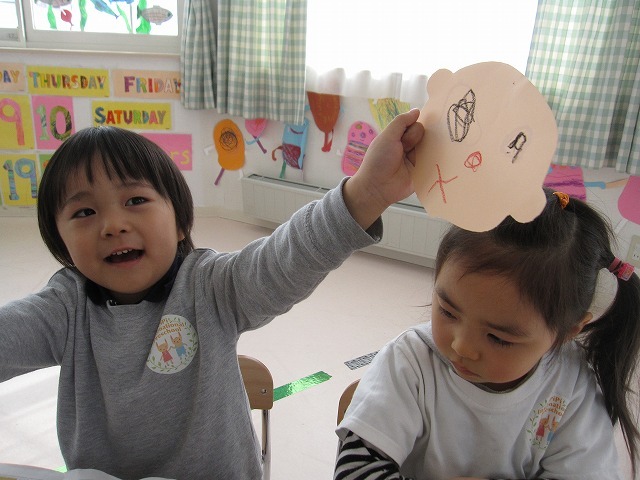 We identified different parts of the face, such as; eyes, ears, mouth, and nose. 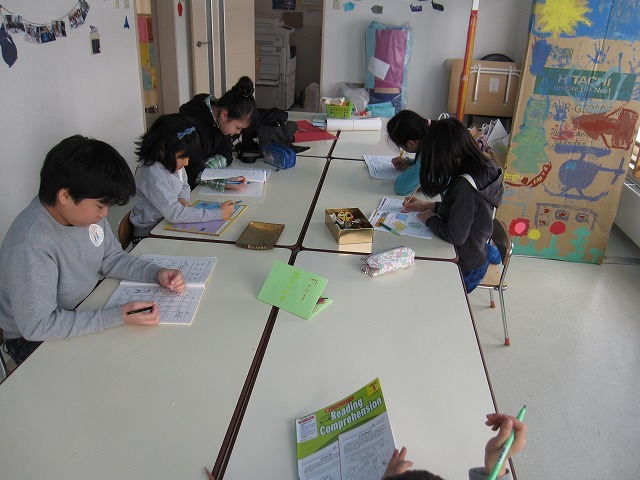 After lunch we had a good workbook session. 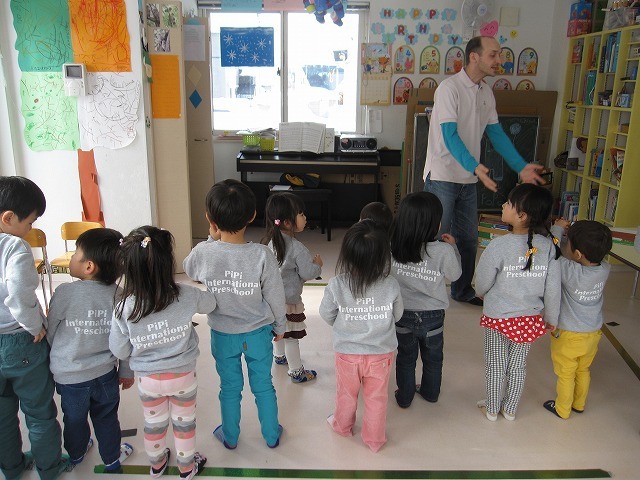 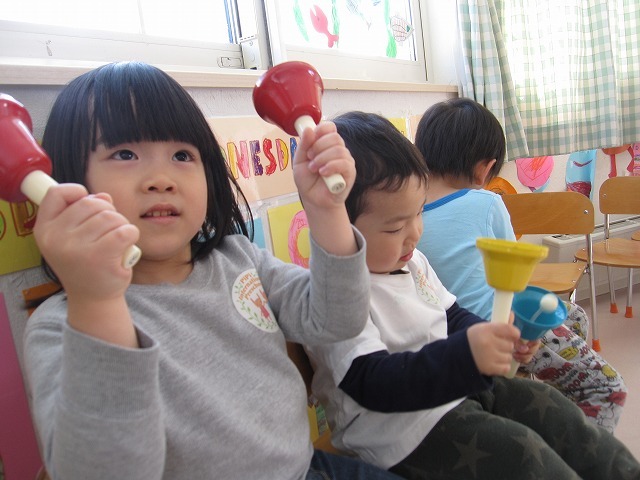 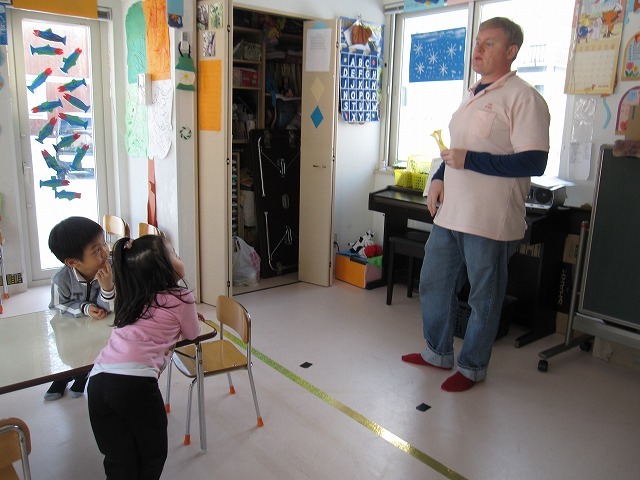 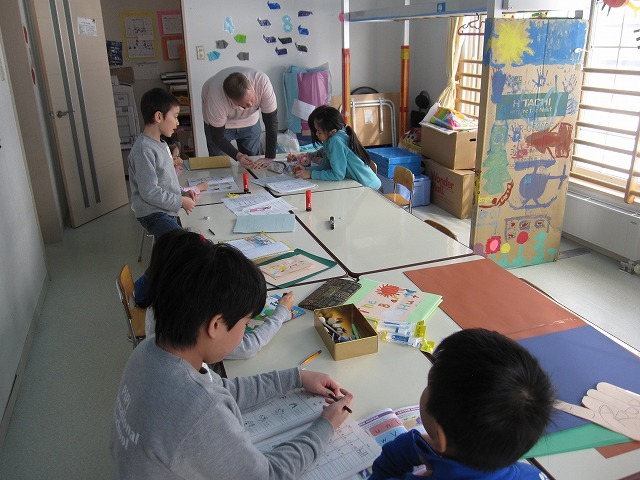 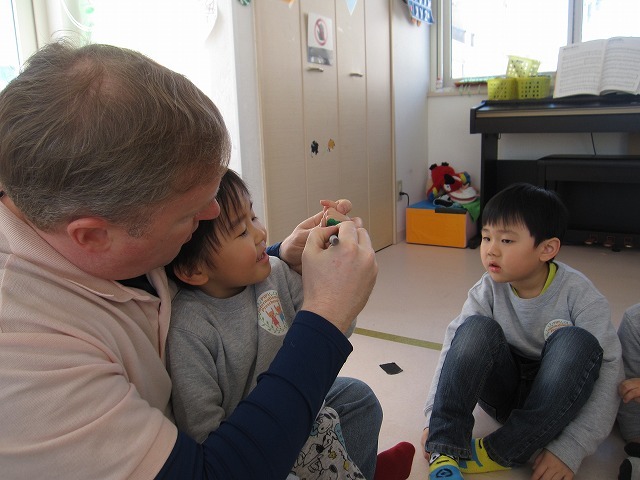 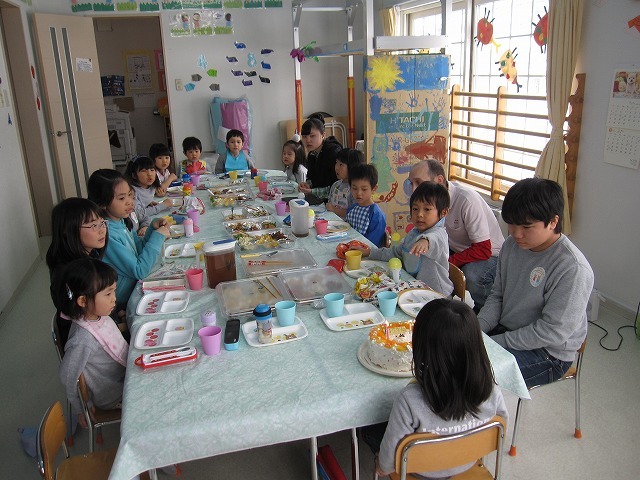 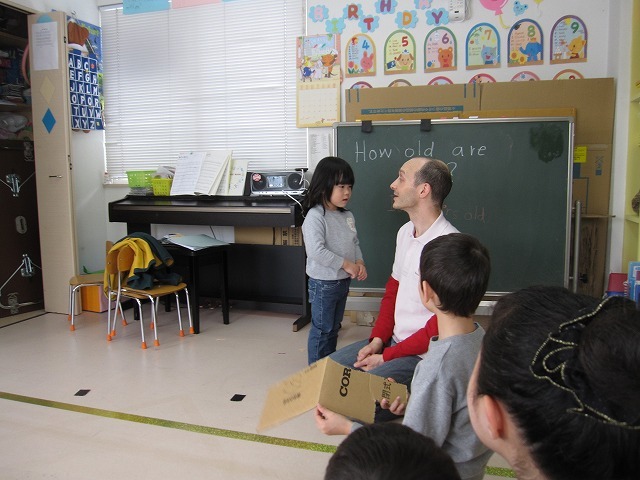 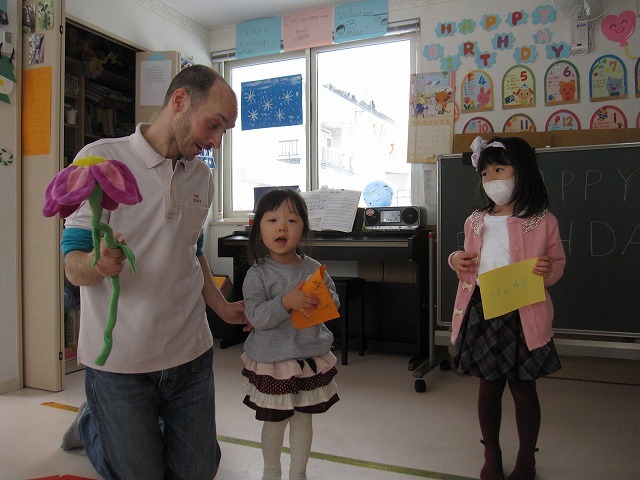 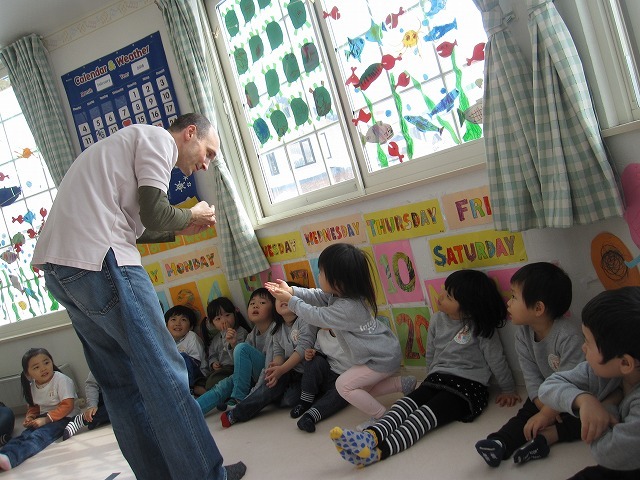 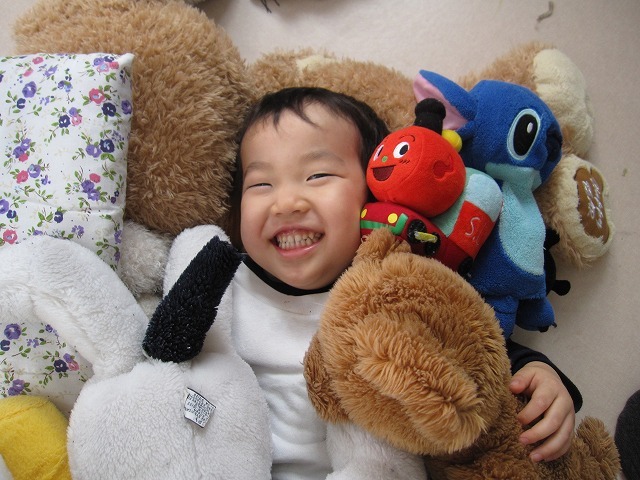 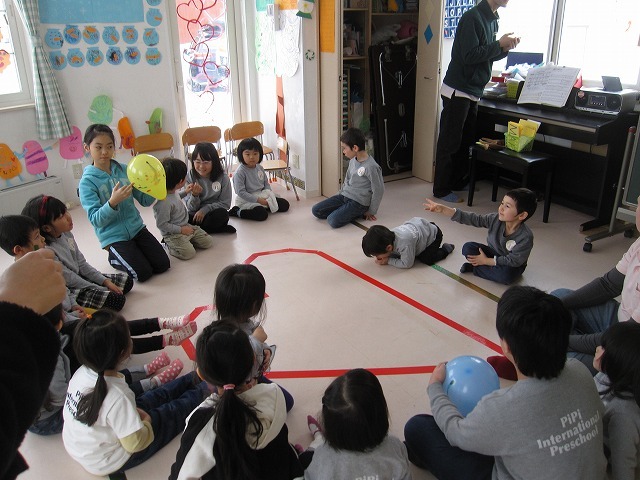 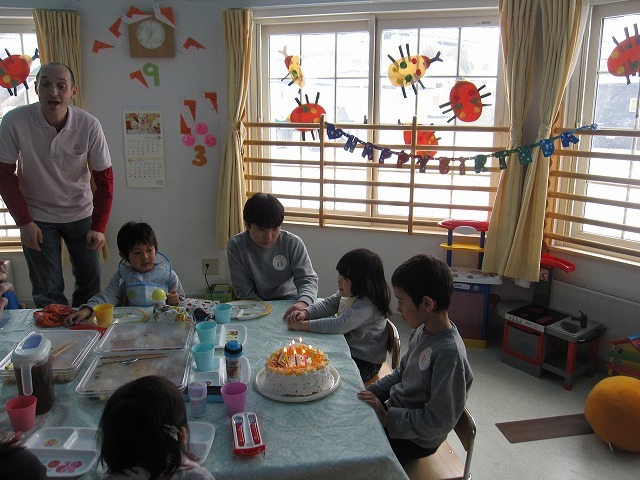 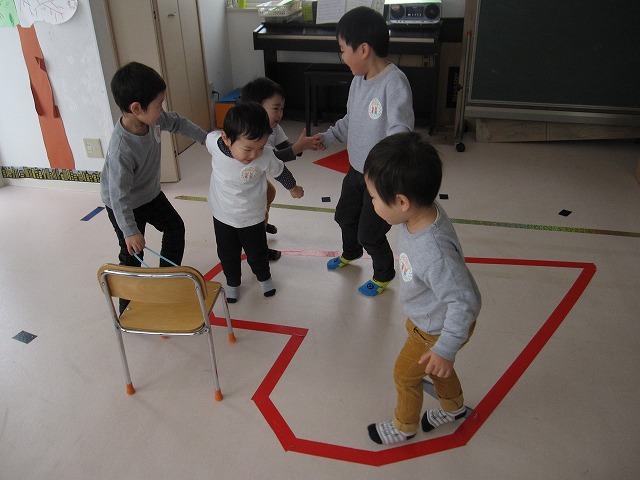 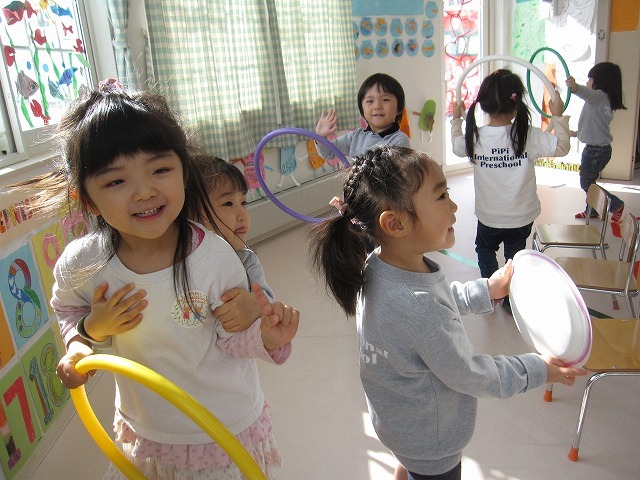 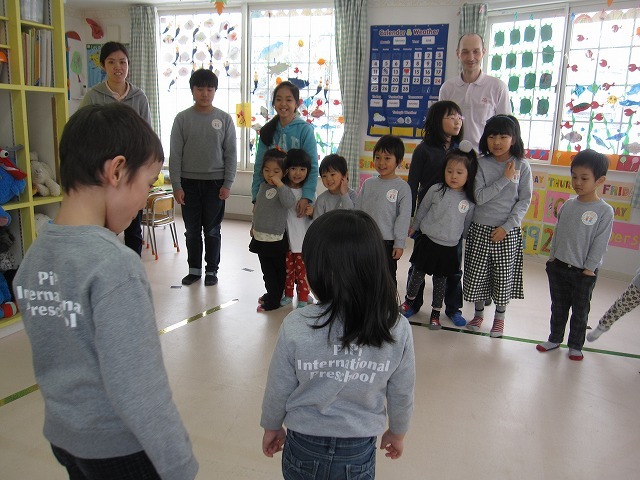 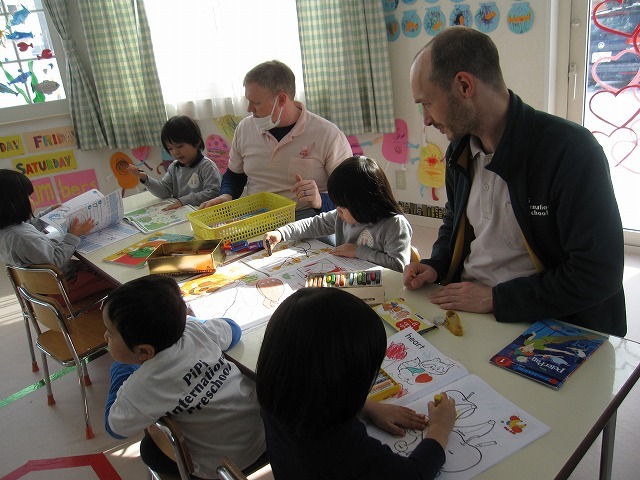 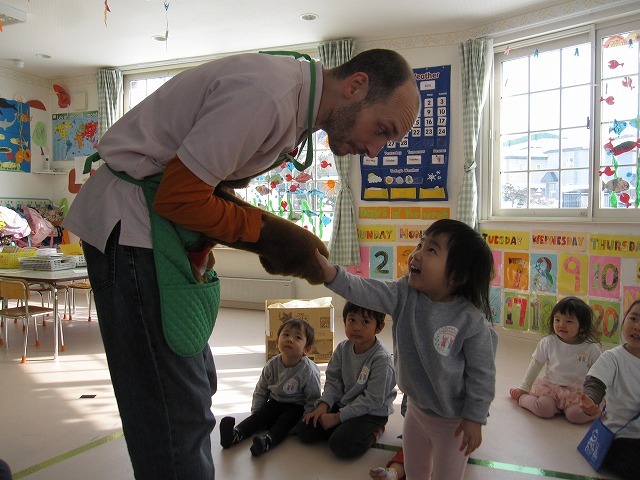 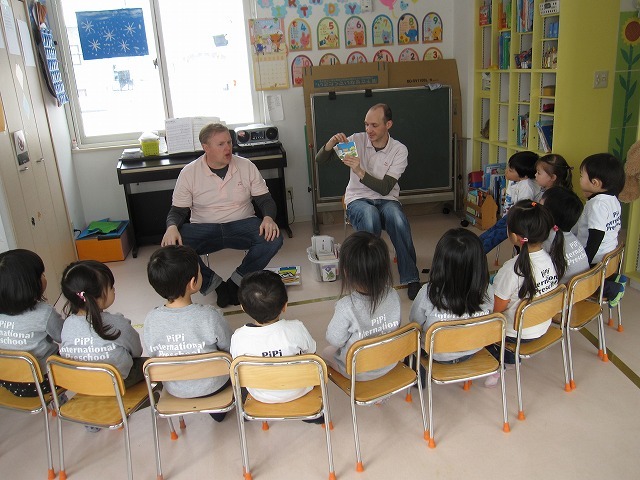 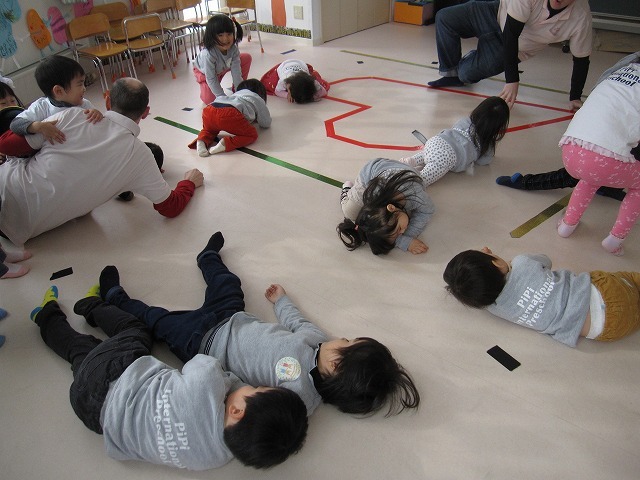 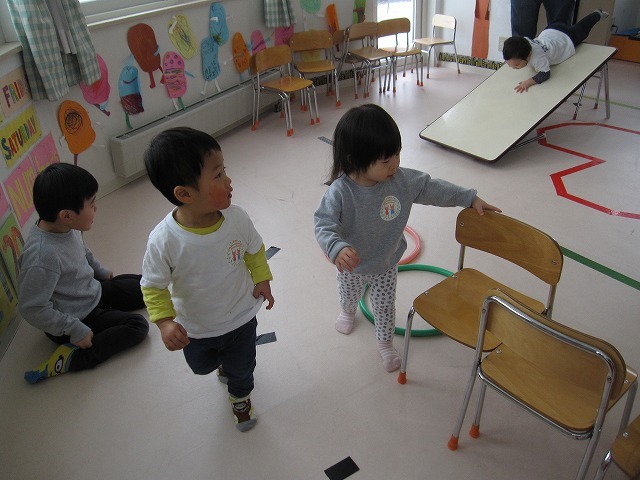 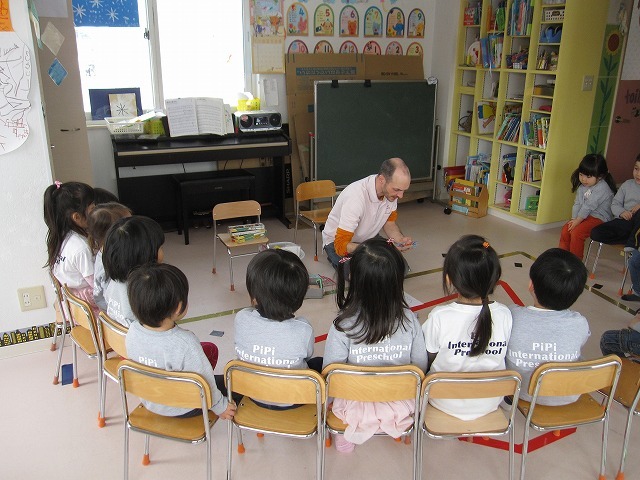 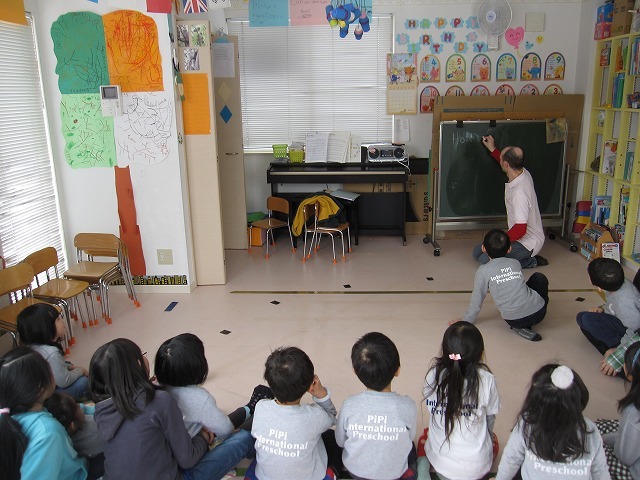 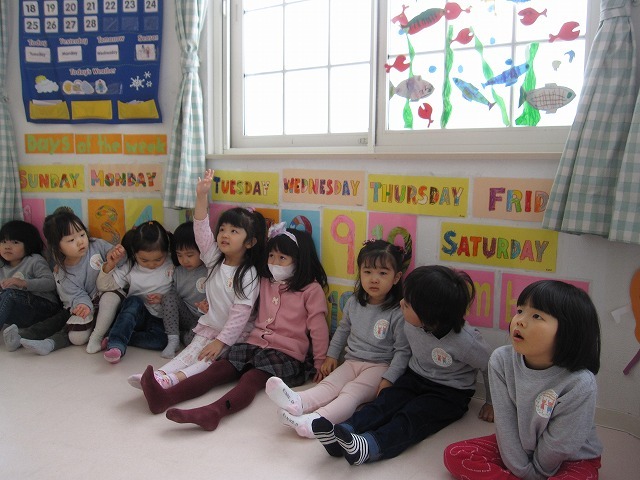 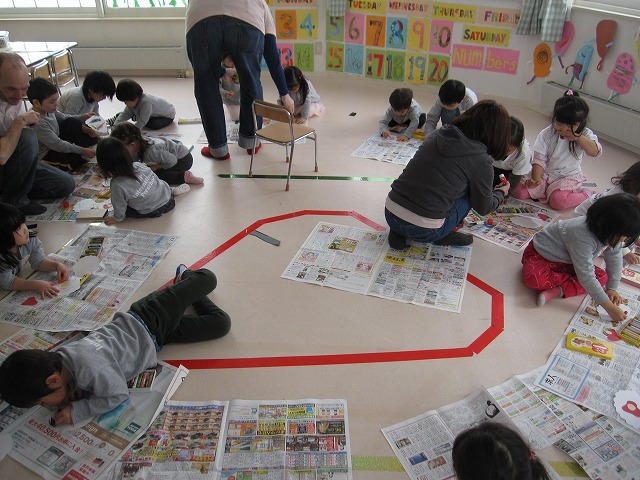 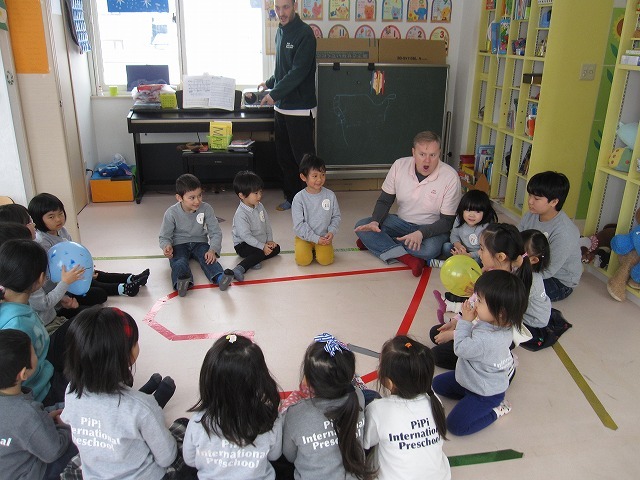 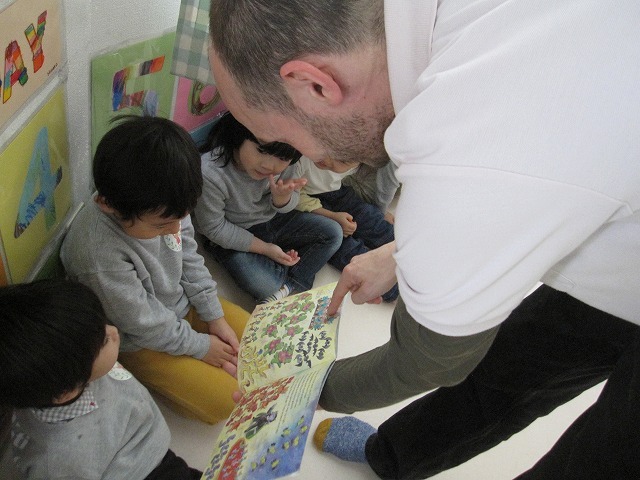 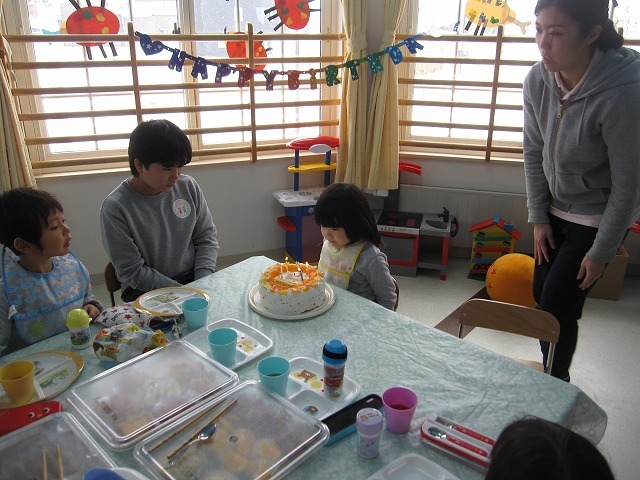 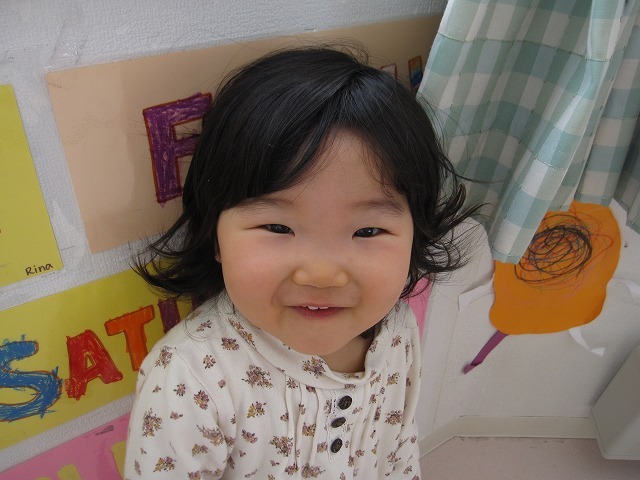 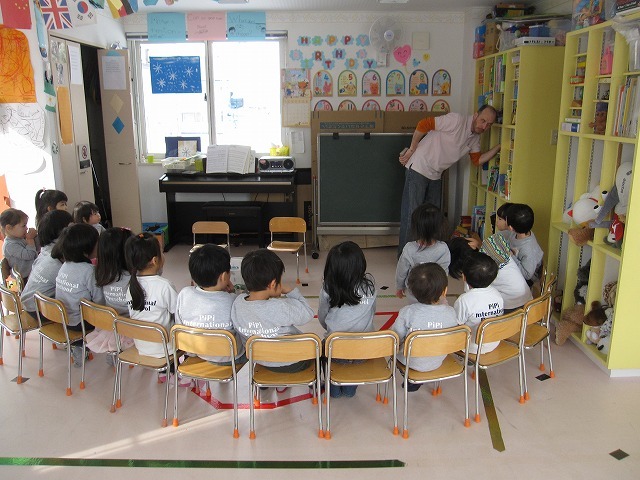 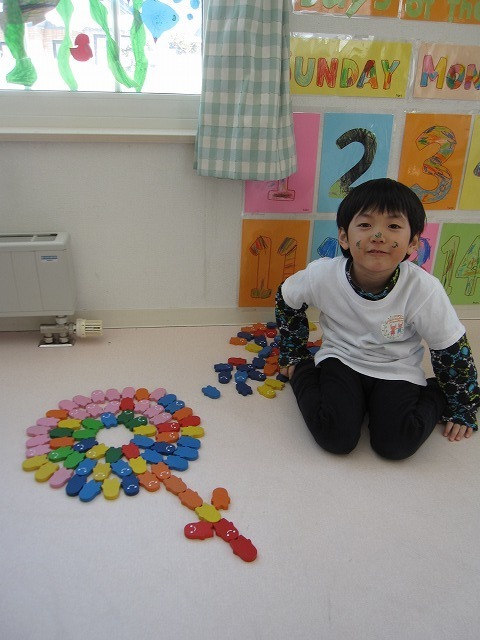 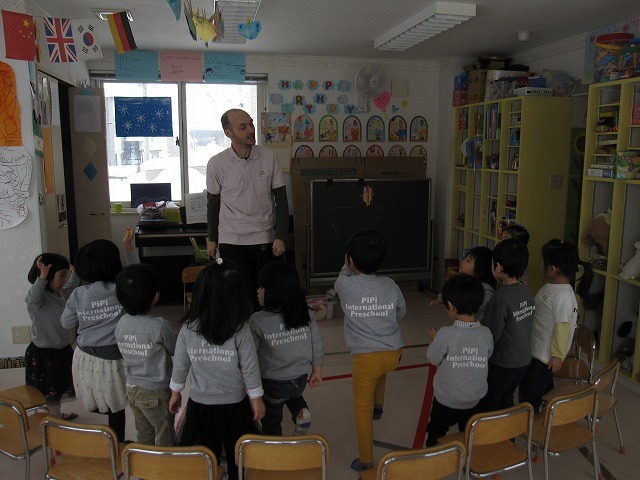 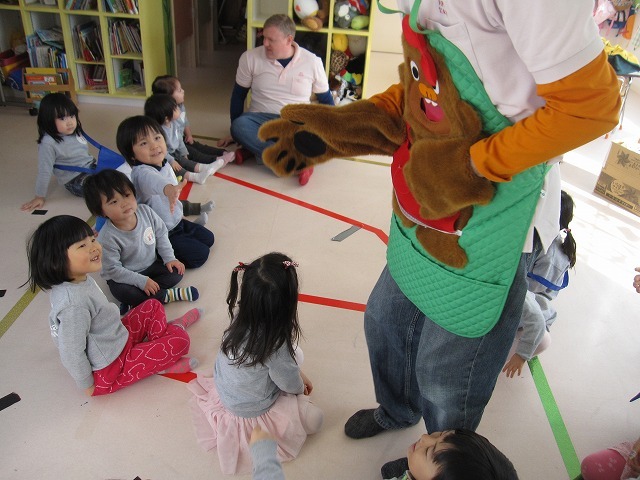 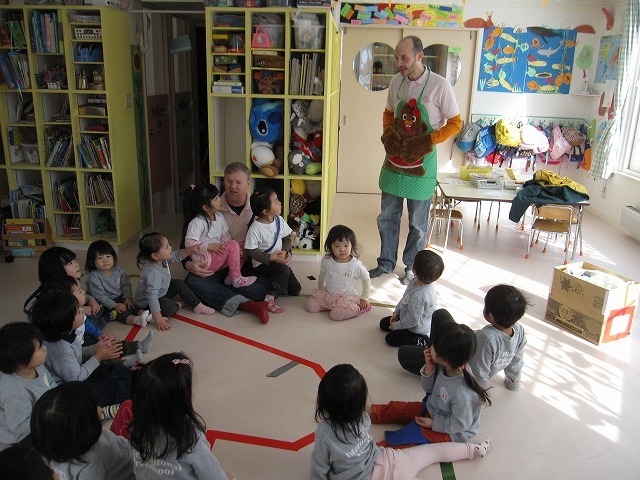 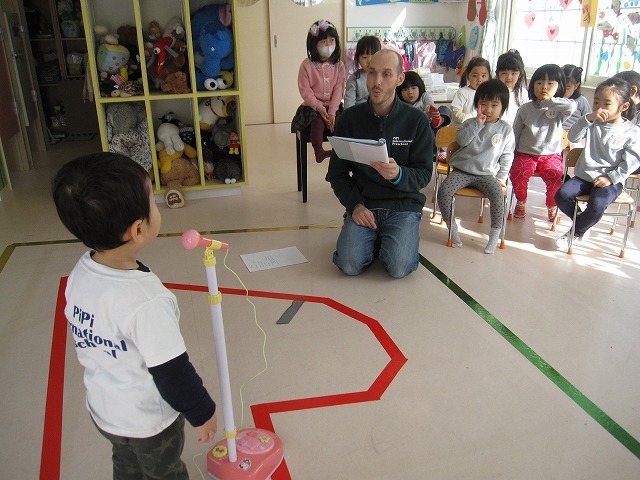 The children who are in the Happyokai play had a chance to practice their lines upstairs, while the other kids enjoyed some brain stimulating activities.